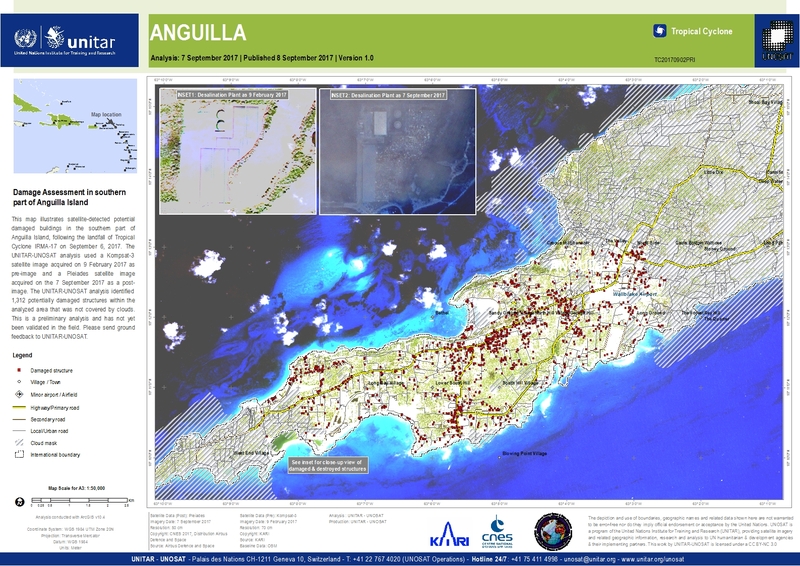 This map illustrates satellite-detected potential damaged buildings in the southern part of Anguilla Island, following the landfall of Tropical Cyclone IRMA-17 on September 6, 2017. The UNITAR-UNOSAT analysis used a Kompsat-3 satellite image acquired on 9 February 2017 as pre-image and a Pleiades satellite image acquired on the 7 September 2017 as a post-image. The UNITAR-UNOSAT analysis identified 1,312 potentially damaged structures within the analyzed area that was not covered by clouds. This is a preliminary analysis and has not yet been validated in the field. Please send ground feedback to UNITAR-UNOSAT.